(Sept 2016) In addition to the excellent dinners I had most every evening in Bordeaux at Chez Sylvie’s – the gourmet chef who opened her home to language students, I also had three other spectacular meals. This Gordon Ramsay restaurant just opened in June of 2016, and we were very pleased with our experience here. I went with three other students who were attending my language school. We arrived around 1pm on a Thursday and had no trouble getting a table inside. The outside terrace was full, but we craved the air-conditioning of the inside of the restaurant, which is beautifully decorated. We ordered the lunch menu, which is 39 euros, and with wine ended up costing us each 52 euros. The food was beautifully presented – like a work of art – and even more tasty. I started with the foie gras, then had an exceptionally fresh local fish for the main course, which was served with an innovative grilled lettuce. For dessert I indulged in the flaming Baked Alaska with gooseberries. The next evening, we returned to share a bottle of wine at the rooftop bar, and on the way up stopped to tour the one-Michelen star Le Pressoir de’ Argent Gordon Ramsay restaurant on an upper floor. It is only open for dinner. Very impressive and serious looking, with a menu set at 165 euros – a bit spendy, I thought for a one-Michelen star, when there are several in Napa and Sonoma for far less. The meal that eclipsed all meals, however, occurred at the house of my good friends, Christian and Malou. I have known them for 8 years, and consider Christian to be one of my mentors for the MW. He taught me so much about Bordeaux wines, and wine evaluation. As the former winemaker at Chateau Latour, he has an amazing collection, and was kind enough to share a bottle of 1990 Latour with us for dinner. Malou, not to be outdone, opened a bottle of 1989 Chateau Lynch Bages, an estate where she has worked for years. Thus began one of the top ten dinners of my life, all served on the terrace overlooking the pool and garden. 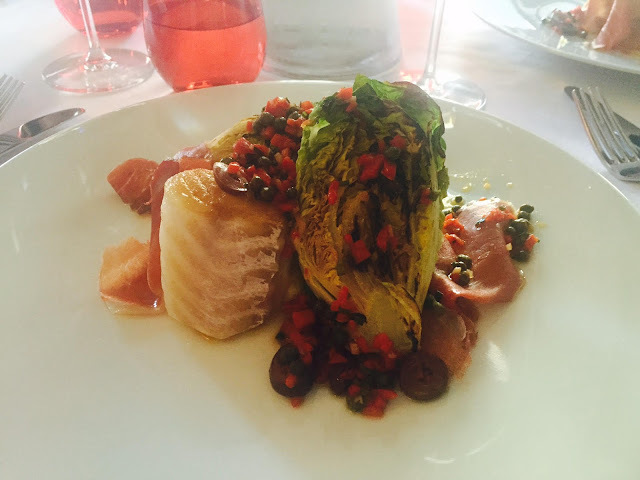 The other great culinary experience for me in Bordeaux was quite simple, but very tasty and memorable. Sylvie told me that there was a cute little farmer’s market every Sunday morning along the Garonne River Quay just north of Quinconces (often referred to as the Marche des Quais). So on Sunday morning after the usual French breakfast of coffee and toast with jam, I put on shorts, a T-shirt, and tennis shoes for a brisk walk along the quay. The morning was already warm and humid, a precursor of another 95 F degree-day in Bordeaux. However, it was still fresh around 10am when I arrived on the quay to an amazing scene. It seemed as if everyone in Bordeaux had decided to walk or jog along the quay on Sunday morning. I passed people with dogs, children in strollers, skateboarders, and many joggers. On the river, boats chugged along, and it was a happy, buoyant, colorful scene for the senses. Suddenly I saw signs for oysters, and realized I had come to the farmer’s market. It was very colorful, and filled not only with oysters, but stands with fresh flowers, large pans of paella, fresh breads, cheeses, fruits, vegetables, and many other delicious local items. I even stumbled upon a beer stand. Who knew they made beer in Bordeaux? After wandering around awhile and making sure I got in enough steps for the day, I headed back to one of the many oyster stands and for only ten euros was given a platter of seven fresh oysters, lemons, a basket of bread, and a plastic glass of Bordeaux bubbly. I settled down at a small wooden table with a perfect view of the quay and all of the people jogging, walking, strolling, and promenading along the river. It was a sublime moment, and a perfect memory of a Sunday morning in Bordeaux. (Sept. 2016) Probably one of the most exciting afternoons I spent in Bordeaux was visiting the new museum that just opened called Cite du Vin. Several years in the making, the unique modern architecture was designed jointly by the male and female team of Legendre and Desmazieres. The design is supposed to reflect the Garonne River that flows outside, and mesmerizes with its swirling mass of silver and gold metal with mirrors. The price of admission is 20 euros, which includes all of the exhibits plus a free taste of wine. 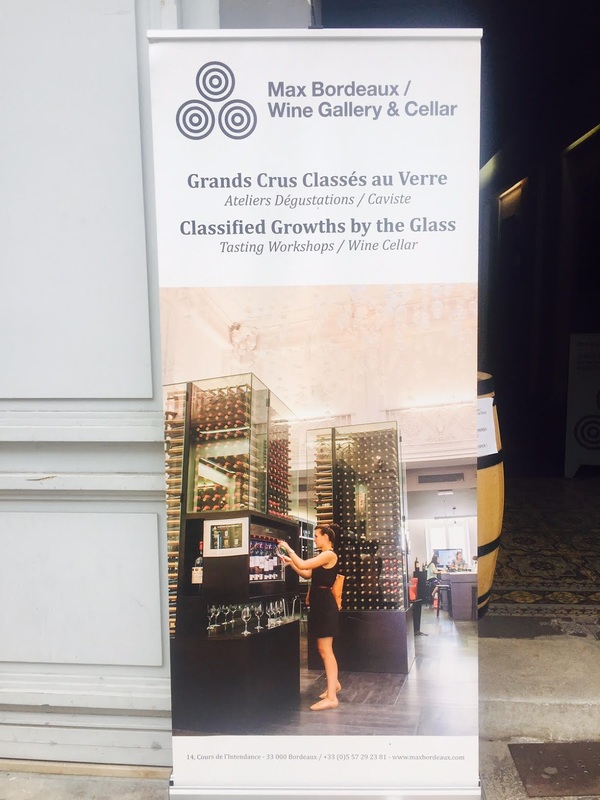 The exhibits are on the second and third floor, and you are given a headset and encouraged to walk around and learn everything you want about the world of wine. There are serious exhibits, and fun and interactive ones, such as guessing the scents of wine, and feeling the textures with fabrics. Every subject concerning wine is covered, ranging from business, viticulture, winemaking, art, poetry, music, food pairing, innovation, and even the dark side of wine in terms of drinking too much. They recommend that you allow at least 2 hours to see the exhibits, but this is not even enough. I only made it through half of them, and you end up losing your companions because everyone is listening on headsets. There is no guided tour, so you wander around to exhibits that interest you. It would be a good thing to do on a rainy day by yourself. 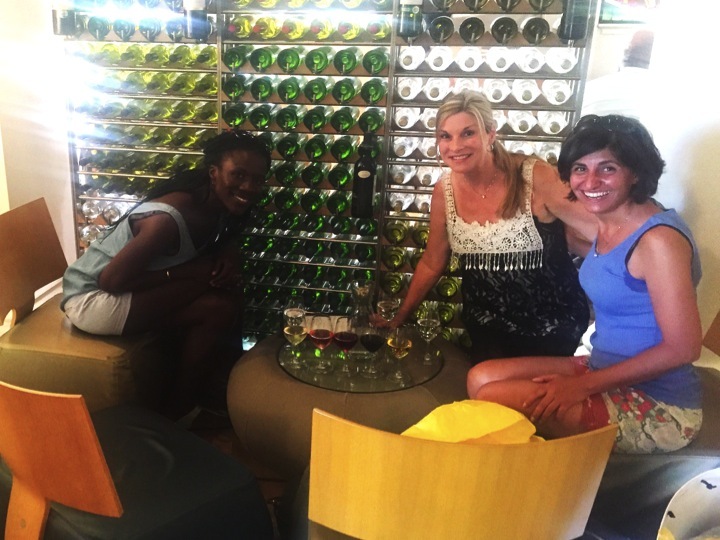 In addition to the wine exhibits, there is a great bookstore, and a huge circular wine shop with wines from all over the world, including the most expensive wines from each country. There are also two restaurants and a bar at the top that requires an elevator ride. Once there the price of your ticket allows you to taste any wine of your choice, and then wander outside on the narrow balcony for a view of the whole city. It is truly impressive, and I believe that is what the designers and the City of Bordeaux wanted to create. (Sept. 2016) Bordeaux is known around the world for their sophisticated red wines. However, if you visit Bordeaux during the heat of the summer when the temperatures can soar into the mid 90’s F, it is difficult to crave a big heavy red wine. But guess what? That’s not what the residents of Bordeaux drink in the summer. They enjoy their crisp whites (which are widely exported), and also the refreshing Bordeaux rose and sparkling wines. 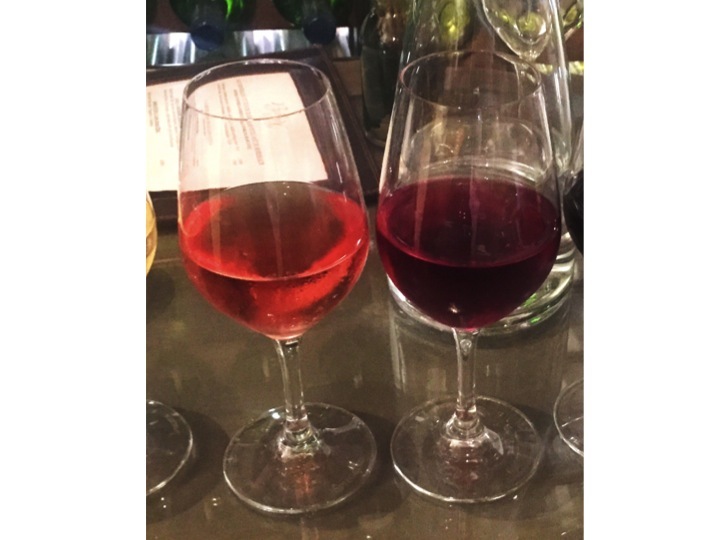 Bordeaux Rose and Darker "Rose Clairet"
Even more impressive are some of the white sparkling wines they are producing from semillon, sauvignon blanc, and muscadelle, as well as the red grapes of merlot and cabernet franc. Called “Cremant de Bordeaux” these wines lack the elegance of Champagne, but are still enjoyable as an aperitif on a hot day. Even better news is the fact that most of the roses, clairets, and cremants produced in Bordeaux are inexpensive – ranging from 5 euros per bottle for a simple rose and up to 15 euros per bottle for a more serious cremant. What a great deal – I just wish they would export a bit more of them. CIVB Bar a Vin – Where You Can Drink Amazing Wine for Two Euros! This great wine bar called Bar a Vin, located across from the Tourist Office in downtown Bordeaux, is the brainchild of the CIVB (Council de Interprofessional Vin Bordeaux). It is a brilliant concept designed to showcase the many regions of Bordeaux wine by allowing the visitors to taste a full glass of wine for only a few euros. For example, you can order a glass of bubbly (Cremant de Bordeaux) for only 3 euros, and a glass of Bordeaux white or rose' for only 2 euros. A great Sauternes is only 6 euros, and a Grand Cru Pauillac is only 8 euros. Even better, you can order a half a glass for half the price. The wine menu changes daily, so it is always interesting, and the staff is well educated and can provide solid information on the wines. They also offer a wine map of the region, as well as platters of cheese, foiegras, and charcuterie for 6 to 8 euros. The décor is beautiful with stained glass, statues, tapestries, and paintings. I ended up going here six times in the two weeks I was in Bordeaux – sometimes with friends, and other times alone, where I could enjoy a relaxing glass of wine and read a book. The CIVB is now wisely opening up more bars in major cities around the world, with a new one just established in New York City. Bar Max features small tastes of wine from an enomatic wine-dispensing machine for a fee, as well as educational workshops. They are famous for the fact that you can taste many of the Grand Cru wines, and even First Growth wines. Though they charge anywhere from 20 to 30 euros for these famous wines, it would cost hundreds of dollars to buy a bottle, so it can be a good deal if you just want to try them. Last time I visited Bar Max I was with with a Sonoma Wine CEO who had never tasted any of the First Growth wines. She thought it would be good for her professional development to know how they tasted, so she paid $125 euros and was able to taste all five. I think she got a great deal, because buying a bottle of Chateau Margaux, Lafite, Latour, Mouton-Rothschild and Haut-Brion would have cost her anywhere between $3000 and $10,000 or more, depending on the vintage. The selection at Bar Max varies, and so the First Growths are not always available, and the vintages are usually not the best, but there are plenty of good wines to try. Prices range from 1 euro for a Bordeaux rose taste up to around 30 euros for the high end wines. This amazing wine shop is located in downtown Bordeaux, very close to the CIVB Bar a Vin and next door to the Grand Hotel. From the outside L’Intendant appears quite small, but when you enter, you see a winding staircase and discover it climbs up five flights – with the wines becoming more expensive as you climb. Magnums are on the top floor. The staff is friendly, and invites you to look around even if you are not buying. I wasn’t planning on buying, but the prices are good and I decided to pick up a few nice bottles to take back to the house for dinners. All of the great wines of Bordeaux, including First Growths in multiple vintages, can be found here. (Sept 2016) When most people hear the word “Bordeaux,” the first thought that comes to mind is usually “wine,” but Bordeaux is actually situated very near to the Atlantic Ocean and is home to many famous white sandy beaches, as well as the largest sand dune in Europe – the Dune of Pilat. On this trip I decided to explore the other side of Bordeaux, and enjoy some of the touristy sites located only a few miles from some of the famous vineyards. Of course, I also enjoyed some very fine wines! On all of my other trips to Bordeaux (this was the 6th time I’ve visited), my focus has always been visiting the vineyards and chateaux of the region. This time, however, I was in Bordeaux for a two-week French language immersion class without a car. Living with a French family, as part of my immersion experience, I was ideally located with walking distance of the CIVB Bar du Vin, the Grand Hotel, trams, and the Garonne River. Therefore I became a regular citizen, walking almost everywhere, and taking public transportation (tram, bus, train, taxi). The house I lived in was built in the late 1800’s and was located on the Rue Palais du Gallien. Built of stone, it was tall and narrow, with a beautiful long garden in the back where we ate dinner most evenings. My room was located on the 3rd floor of the 4-story structure with a bath across the hall. I had to walk up and down a circular flight of stairs several times a day, and many nights had trouble sleeping because the un-air-conditioned room was very hot in late August/early September. However, I greatly enjoyed the evening meal of four courses with wine, including entre, main course, a cheese course, and then dessert. Each night I struggled to understand the French conversation, but by the end of the two weeks I was able to converse on a basic level. During the mornings, I took intense French language courses, and in the afternoon met with business colleagues or attended the FrancLangue’s cultural excursions to local museums. One Saturday, I decided to visit the famous Dune of Pilat – the largest sand dune in Europe, which is located about 35 miles outside of Bordeaux right near the ocean. Therefore, I walked to the tram stop in the large square called Quinconces, where I took the tram to the St. Jean Gare train station. From there, I caught the express train to Arcachon, which took 30 minutes. Arcachon is a charming little seaside town that I visited later in the day for dinner on the beach. I exited the train station and walked only a few yards to the #1 bus stop. For one euro, I enjoyed the 30-minute bus ride that wove through tree-lined streets with flashes of the ocean in the distance, as we headed in the direction of the Dune of Pilate. People with surfboards got on and off the bus at the various beaches we passed. When we arrived at the famous park of the dunes, I followed the signs and soon was passing through a bevy of small shops selling ice cream and souvenirs. Eventually I came to a sandy path surrounded by trees, which, after about a five-minute walk, opened up to the largest sand dune I have ever seen. The Dune of Pilat has apparently been formed over many thousands of years, and shifts in size and shape based on the wind and ocean. Right now it is around 110 meters tall (over 300 feet), and is quite steep. I watched in amazement as hundreds of people climbed slowly to the top – everyone barefoot and shuffling through very soft white sand. After about 15 minutes of climbing, I reached the top and was rewarded with a great view of the ocean and Cap de Ferret across a narrow strait of water. Boats zoomed around and many people splashed in the water far below. Since the day was in the high 80’s F with some humidity, I could perfectly understand the desire to be in the water. One surprising fact was that forests of pine trees surrounded the dune, and I wondered what type of pine grows in sandy soil near the ocean. After sitting in the sand on top of the dune for a while, with hundreds of other people, I slowly descended to the beach far below and waded in the water. I was dreading the long high back up the top of the dune to the bus stop, when I saw a sign stating there was an easier way back. Therefore, I followed the directions up a steep flight of stairs that led to a residential neighborhood. This was a bit confusing – how to get back to the bus stop? So I asked several people who all pointed in the general direction of the road, and after about a 30-minute walk through a housing developing, I came out on the main road again and saw a different bus stop. Hoping I could still catch my bus back to town from there, I waited a short time until another bus approached, and thankfully it was the #1 bus back to Arcachon. Several years ago I had visited the beach at Arcachon on a cloudy cold day, and it was empty and lonely looking. Therefore, I was unprepared for the masses of tourists that sunbathed on the beach and frolicked in the water when I arrived. The bus dropped me off back near the train station, which is within walking distance of the charming downtown of Arcachon and the beach. I liked the fact that Arcachon has a walking pedestrian street lined with colorful shops, flowers, and restaurants. Peeking in shops and reading menus, I enjoyed a leisurely stroll through town until I came to the white sandy beach. It was such a beautiful sunny day with everyone in a happy holiday mood, that it was impossible not to feel relaxed. After wading in the water a bit, I found a great little restaurant with a view of the beach, where I enjoyed a goat cheese salad and a big plate of mussels. Seafood, especially mussels and oysters, are the specialty of the area. I enjoyed this with a glass of local white wine made from muscadelle, one of the less well known grapes that is allowed in a Bordeaux blanc (also called Sauvignon Vert). It had floral notes, was very fruity, and slightly sweet – just perfect with my mussels. After my early dinner, I caught the train back to Bordeaux, and then went to visit the CIVB Bar du Vin (see next post). Wine in Scotland – Why It’s Whiskey of Course!